The establishment of western civilization in Australia has left a seemingly indelible 'footprint' on the national landscape, flora and fauna. The impacts wrought though the pastoral (e.g. sheep and cattle grazing), mineral (e.g. 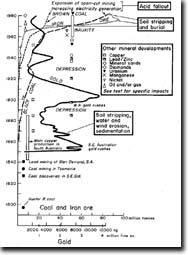 gold, iron ore and coal), cropping (e.g. wheat) and intensive agriculture (e.g. dairying and irrigation) industries are many and varied. 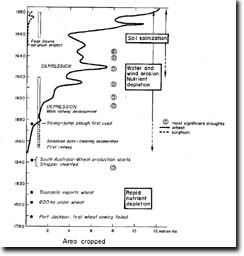 The types of changes imposed on local environments were depicted in the time-line diagrams shown below constructed by Jenkin (1986) and include pastoral, mineral and cropping industries as well as intensive agriculture. in Australia (after Jenkin 1986), 137. Australia (after Jenkin 1986), 139. Clearly, urbanization also followed rural development. The relations between population growth and the major events affecting Australian soils (after Jenkin, 1986), 150. Jenkin noted that only early main discoveries of metals (such as gold) caused sudden increases to population. Furthermore, miners left NSW for the richer fields in Victoria (data obtained from the Atlas of Australian Resources and Peel (1973)). An introductory paper on the historical aspects of land degradation in Victoria is provided elsewhere on this website. In the series of articles on landscape change in the Costerfield district, research was conducted at a site from which the origins and effects of settlement could be traced in order to catalogue land degradation, particularly tunnel erosion, in the Goulburn Broken region. The characteristics of the environment were ascertained from the time of European settlement and introduced changes were documented at a local scale. The new settlers attempted to create a 'little England' (e.g. Powell 1989) in the colony and the impacts of their activities on many Australian landscapes varied in their extent and severity. Alterations were made to vegetative cover, producing a change from forest to degraded land in many localities. The complex series of interactions between various environmental components were fundamentally associated with changes to the hydrological cycle, and the outcomes differed in nature, extent and severity between landscapes. For example, some environments were inherently unstable (e.g. the Dundas Tablelands in the Glenelg Hopkins region) and the effects of changed landuse were catastrophic. Generally speaking, deleterious impacts were made on native flora and fauna, and exotic birds, rabbits, hares and foxes were introduced. 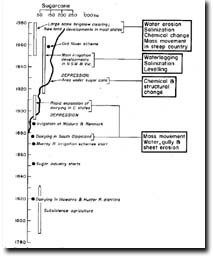 Water quality declined, soil erosion by wind and water increased, and mass movement and soil salinization became more pronounced. Jenkin (1986) noted that cattle were introduced to the High Plains in the 1830s and there was a rapid pastoral occupation of land in both south-eastern and south-western Australia around 1850. In particular, he mentioned that alpine peat bogs had declined owing to burning and trampling since approximately 1840, so the resultant hydrologic disruption caused, amongst other problems, severe erosion and a decline in water quality. Many researchers have used historical information to demonstrate the effects of introduced agriculture on different environments around the world. With respect to Australia, a considerable amount of attention has been focussed on catchments in the south-east. Studies include those conducted by Eyles (1977a, b), Gillespie (1981), Bird (1985), Starr (1989), Prosser (1991), Prosser and Winchester (1996), Brierley and Murn (1997), Brooks and Brierley (1997), Wasson et al. (1998) and Fryirs and Brierely (1999). 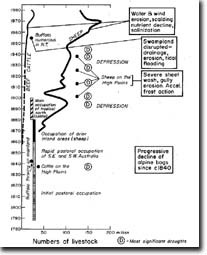 The use of detailed historical data as they relate to the onset of tunnel erosion in Victoria has not been demonstrated apart from that published b Boucher and Powell (1994). 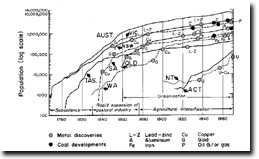 Brief overviews were presented in the Goulburn Broken [(Downes 1946, 1949, 1958, 1974), Spate 1980a], Port Phillip (Hexter et al. 1956) and Glenelg Hopkins (Marker 1959) regions of the State. In unpublihsed research, Fisher (1993) found some examples of tunnel erosion in the banks of Scrubby Creek, located approximately 40 km north of Melbourne, in the Port Phillip and Westernport region. He examined historical records but in considerably less detail than that produced by Boucher (2002) for the Heathcote-Costerfield district in the Goulburn Broken catchment, and from which this series of articles is taken. The pesent study is the most comprehensive published study of historical geography as it relates to processes of tunnel erosion in Australia. It covers land degradation from the time of European settlement in the late 1830s including the area that eventually became Costerfield, to approximately 1900 when tunnel erosion was known to have been present. Numerous general reports have been published on land degradation in a particular area or region. However, it is necessary to examine an environment in the finest detail possible in order to gain a multidisciplinary understanding of the timing, magnitude and impact of the 'human-initiated' factors involved in relation to innate environmental characteristics over both space and time. For example, a particular action (e.g. widespread deforestation) may have both on-site (e.g. erosion) and/or off-site (e.g. sedimentation and loss of water quality) implications that initiate long-lasting repercussions. Furthermore, environmental problems may be seen as a response to an event (e.g. an extreme rainstorm) or as a result of threshold conditions being exceeded (e.g. overgrazing by stock and native animals during a prolonged severe drought). The precise impact of Aboriginal use of landscapes is uncertain, but the changes wrought by Europeans were substantial.